This is a RPG Maker MV plugin that adds more features to battle. These new features include a new critical hit flash coloration because the previous one is a slight red glow that is easy to miss. Damage popups have the option of having rolling numbers before they land on a finalized number. This is to help players in figuring out which numbers are still new when multiple popups appear at the same time. These two options can be turned off. New notetag effects have been added. These notetag effects include giving parameter bonuses depending on how high or low HP currently is, a damage cut function that stacks additively on global damage or on certain elemental damage, the ability to overheal past a battler's MaxHP, MaxMP, or MaxTP, a new notetag trait to allow switching two parameters with each other, and some notetags to ease the usage of Yanfly's Buffs & States Core counters. Note: This plugin can also be found inside the OctoPack Battler sample project. Critical Popup: Makes a special rainbow flash critical popup effect when a critical hit lands. This is added because the original critical effect was a very fast red tint that is easy for the player to miss if the player isn't paying attention. You can disable this if you want the default effect. Rolling Damage: Make damage popups roll a little bit before settling on the final damage value. By making the damage popup roll, the player can quickly discern which damage popup is newer if there are multiple damage popups all happening at once. You can disable this if you want the default effect. TP Overheal Maximum: Maximum amount TP can be overhealed if using <Overheal TP> notetag for battlers. - Increases (or decreases if you use -x%) the parameter as HP% is higher. Reaches +x% threshhold at 100% health and reduces proportionally as HP% is lower. This modifier is gone when the actor reaches crisis level HP (which is 25% by default). - Increases (or decreases if you use -x%) the parameter as HP% is lower. This rate scales harder the lower the HP ratio and reaches +x% at 0% HP. - Decreases incoming damage battler receives by x%. This stacks additively with other damage cut-related effects. Damage Cut % cannot go below 0% or above 100% rate. 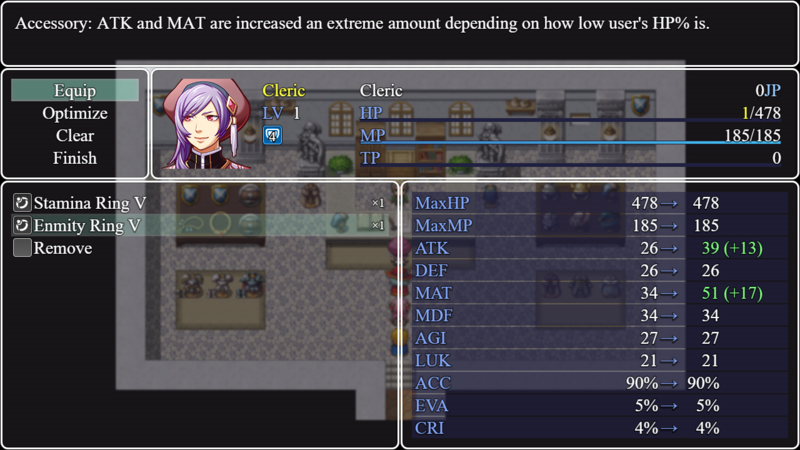 - Decreases incoming damage battler receives by x% if it is a matching element. If using id, replace it with the element's ID in the system tab. If using name, replace it with the element's name in the system tab. If the element's name has an icon text code in it, leave out the icon text code. This stacks additively with other damage cut-related effects. Damage Cut % cannot go below 0% or above 100% rate. - Lets the notetag-affected battler be able to overheal past the maximum HP, MP, or TP amounts. The HP and MP maximum values become their respective maximum parameter values (9999 by default). TP's maximum value reaches the value set in the plugin parameters (200 by default). These effects are only applied inside of battle. - Swaps the two parameters with each other. Replace param1 and param2 with mhp, mmp, atk, def, mat, mdf, agi, or luk. Any battler affected by this notetag will have those parameters swapped. If a battler is affected by multiple notetags that alter the similar stats, priority will be given to states, then equipment, then current class, then actor, then enemy. - If a battler becomes affected by any of the states listed in x, that state will be prevented and the current state will be removed. - Requires Yanfly's YEP_BuffsStatesCore.js. This sets the state's counter or adds to the states counter whenever the state is applied to the battler. This is a notetag made to make setting the counter value easier.